Amsterdam, c.1600, Latin text edition. Untitled map of the West Indies, engraved by either Pieter van den Keere or Jodocus Hondius the Elder. This is the earliest of two plates used to illustrated the Bertius atlas, without longitude and latitude scales. It was replaced by a new plate by Jodocus Hondius the younger in 1616. Amsterdam, 1623, Latin text edition. Five maps on one sheet: larger maps of Cuba and Hispaniola and smaller of Jamaica, Puerto Rico & Margarita. 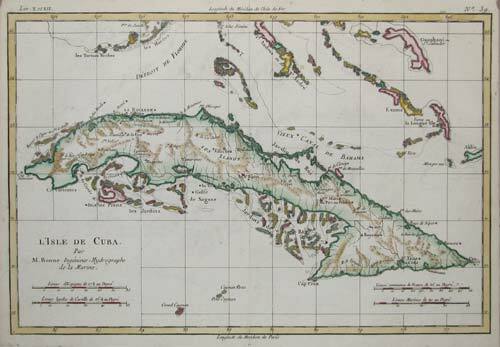 The map of Cuba has an inset of Havana's harbour. Amsterdam, Jan Jansson van Waesberger, 1676. 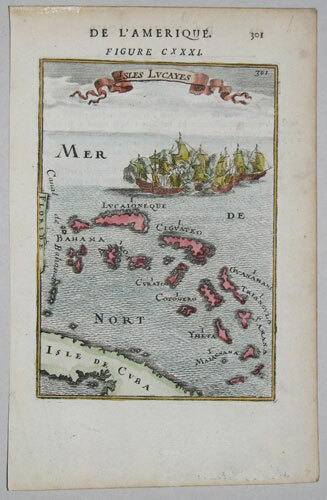 The islands of the West Indies, engraved by van der Keere. Waesberger was Jan Jansson's son-in-law. Amsterdam, Jan Jansson van Waesberger, 1676. 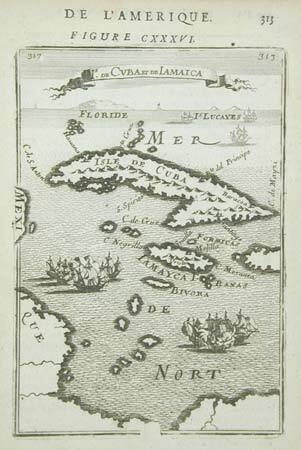 The West Indies, engraved by van der Keere. Waesberger was Jan Jansson's son-in-law. The Travels of Hieronymus Benzo in the West Indies. Leiden, c.1710. Benzo, a naturalist from Milan, travelled in America between 1541 and 1556, Van der Aa included his 'Istoria del mondo nuovo' in a collection of narratives of voyages. With a decorative title cartouche. Nuremberg, c.1740. Five maps on one sheet: St Kitts, Antigua, Bermuda, Barbados and Jamaica. Paris, 1750. 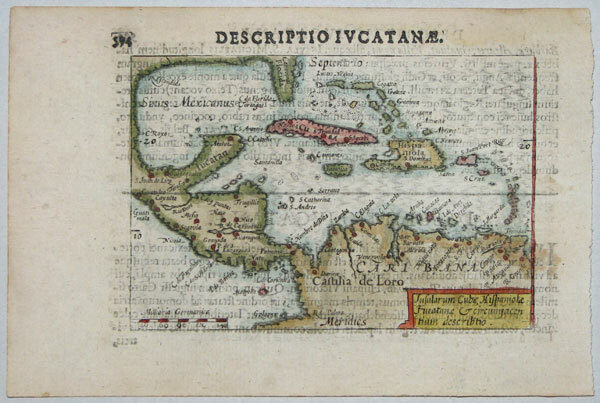 A large and colourful map of the Caribbean, with a decorative rococo title cartouche. Paris, c.1780. With an inset of Bermuda. Paris, Dezauche, c.1780. Derived from Henry Popple's 20-sheet map of America of 1733, coloured to reflect which European country was in control of each area. Paris, 1788. Nine maps on one sheet, engraved by André. 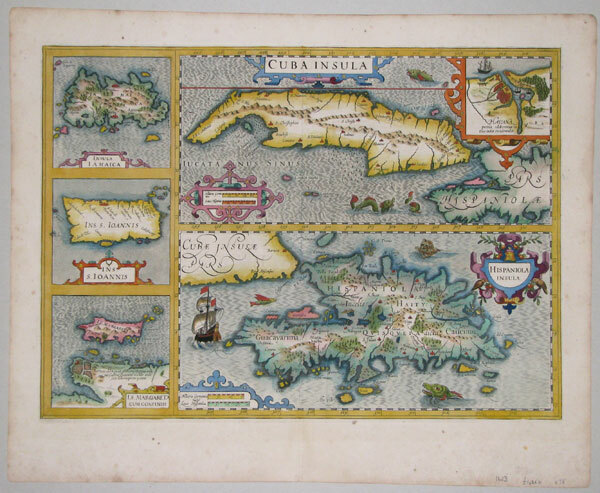 The top half shows the Virgin Islands, with Anguilla, St Martins, St Barts & Barbuda; the eight smaller maps are: St Eustacia and St Kitts; Antigua; Dominica; St Lucia; Barbados; St Vincent; Grenada; & Tobago. London, 1819. A colourful map of the West Indies. London, 1842. Detailed map of the West Indies, issued in the 'London Atlas' by the foremost British cartographer of his generation. Edinburgh, c.1827. Three maps on one sheet. 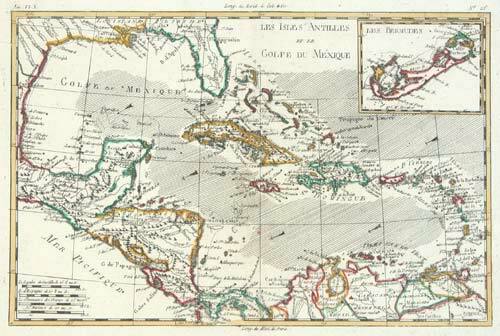 When the map was first published, during the Napoleonic Wars, all three islands were in the possession of the British. Nuremburg, c.1718. The French Antilles, showing from Guadeloupe south to Grenada, showing Dominica, Martinique, St Lucia, Barbados, St Vincent and Mustique. Paris, c.1683. The Bahamas, with a vignette sea-battle. Paris, c.1759. 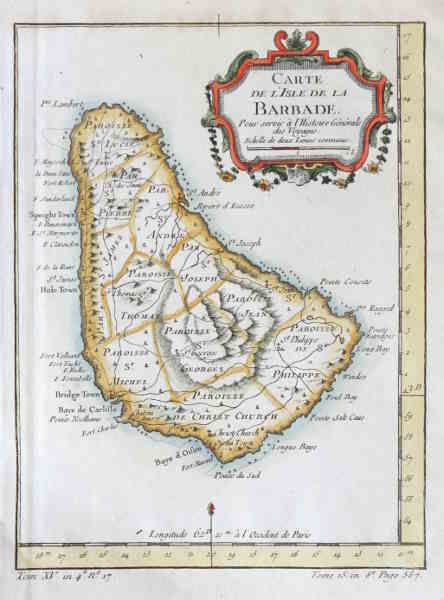 Barbados, marking the Parishes. Amsterdam, c.1602, Latin text edition. 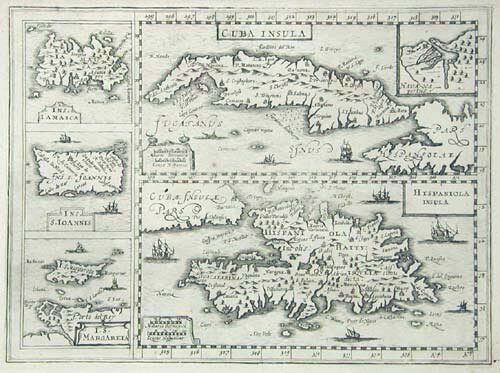 Cuba and Jamaica, engraved by Pieter van den Keere. This is the earliest of two plates used to illustrated the Bertius atlas, without longitude and latitude scales. It was replaced by a new plate by Jodocus Hondius in 1616. Paris, c.1683. 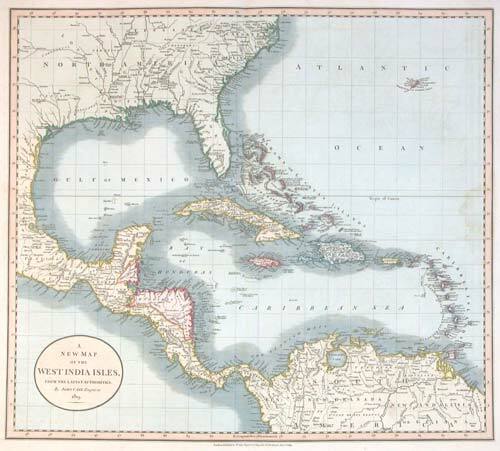 Cuba and Jamaica map, with vignette sea-battles. Paris, c.1783. 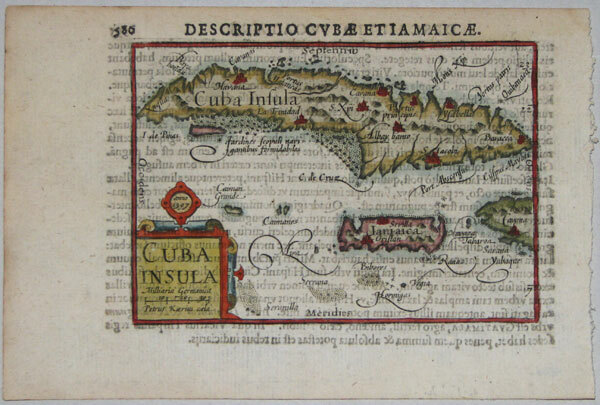 Cuba, with some of the southern islands of the Bahamas.